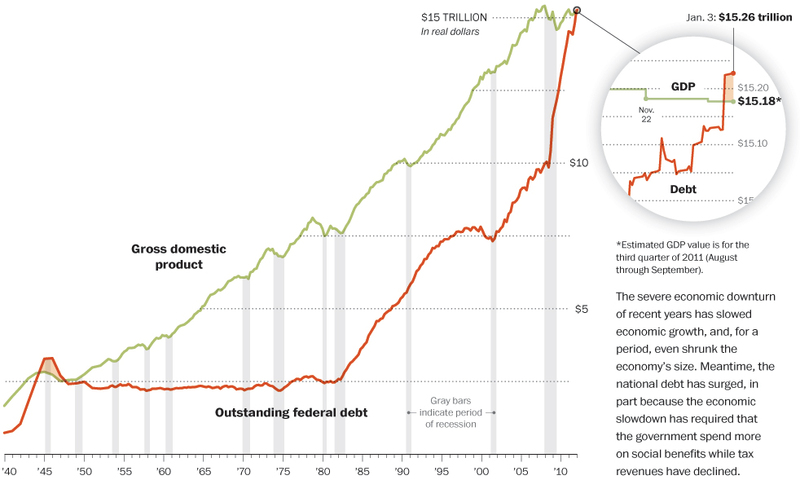 I could not resist posting this beautiful graph of the current state of the momentousness US debt. The graph is particularly useful for eyeballing the historical path of U.S. debt to GDP. Often pundits will say that our current debt-to-GDP ratio is not unreasonable because it is not too high relative to the period following WWII and the Great Depression. It is true that during the post-WWII era, government spending exceeded GDP. Never mind that FDR’s New Deal actually prolonged the Great Depression, and ignore the fact that despite conventional wisdom, World War II did nothing to create prosperity. As Bob Higgs has argued extensively, no amount of money pumped into a depressed economy can bring about genuine economic recovery unless investors and business leaders feel secure in their property rights. But getting back to the graph above. This graph clearly shows that even if the US debt-to-GDP ratio is lower than it was at some previous point in history—the MAGNITUDE of the change is worthy of serious attention. Since the 1980s, the effects of a shift toward a dominant Keynesian view of economic policy are clear. The “old time fiscal religion” was gone and the debts began to pile up. Make no mistake. With the Keynesian deficit finance comes a rhetoric that in good times the budget eventually should be brought into balance (See section 8.4.35). Only not now, the Keynesians argue. Now is a time of crisis. Now is different. When the economy is “doing well,” “recovered,” or when war is over… then the enlightened statemen will know what is prudent and begin running surpluses to pay the debts. The fatal flaw? These arguments turn a blind eye to the basic incentives facing politicians. If they spend more on their special interests, they get elected. If they cut spending on special interests or constituents, the don’t get elected. So don’t be surprised to hear our presidential candidates pay lip service to fixing the debt. That’s what they do. That’s how they’ll get elected. And without rules to change the incentives and limit the ability of statemen to spend, the red line is going to continue to go up.